PatientWorks expands into the office-based physician market with iQ Kiosk and POWERstation Cloud software. CARY, NORTH CAROLINA – September 12, 2016— PatientWorks Corporation, a subsidiary of SalePoint, Inc. and a provider of healthcare self-service systems and patient flow management solutions, today announced that it has acquired the innovative iQ Kiosk and POWERstation Cloud software products from Unicomp Corporation of America (UCoA). The acquired software enables PatientWorks to expand its reach into the office-based physician practice marketplace. iQ Kiosk is a web-based iPad check-in kiosk, where patients can simply sign in upon arrival at the physician’s office. It can service patients that have appointments or with walk-ins. Strong data analytics provide meaningful information to the practice regarding patient wait times and many other activities that impact the patient experience. The application of data analytics permits the practice to gain meaningful insights, and to better understand and improve practice performance. An iQ Kiosk deployment is easily justified by the significant return on a minimal investment. As a complement to iQ Kiosk, the POWERstation Cloud solution automates front-desk patient registration with an efficient “hands-free” data input and verification process that improves staff productivity, reduces insurance claim denials, and establishes an effective patient payment and collection platform. 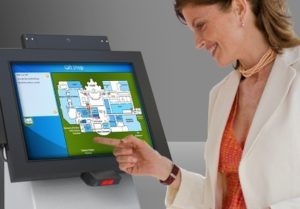 PatientWorks® provides Self-Service Patient Check-in Kiosk and Tablet solutions. KioskWorks® provides a patient centric, customizable user touch screen environment for self-check-in, co-payment processing, interactive wayfinding, event calendar, patient education and fundraising opportunities. The Patient Xpress module captures electronic signatures as well as patient photos and scans insurance cards and/or driver licenses. The data is merged onto the healthcare provider’s forms and automatically sent to their imaging system and/or routed to the Registrar. Queue Navigator manages patient volumes, wait times and check in compliance, whether patients check in through KioskWorks® or directly with registration staff. Admitting personnel can manage patient check-in remotely in real-time at the department level or across the entire enterprise. CheckinWorks® offers healthcare providers the same functionality only on mobile tablets. For more information, please visit www.patientworks.com. UCoA was founded in 1979 and since its inception has specialized in developing cutting edge technology solutions for the healthcare industry. UCoA’s principals average nearly 40 years of experience working with healthcare providers to improve productivity and profitability by applying solutions for document management, revenue cycle management, and patient access management. Its healthcare products are used by over 20,000 physicians in 35 states. For more information, please visit www.ucoa.com. CARY, NORTH CAROLINA – July 14, 2016— PatientWorks Corporation, a patient self-service check-in solutions company, today announced that it has successfully achieved Imprivata Ready! certification with the industry leading positive patient identification solution, Imprivata PatientSecure. The certification awarded by Imprivata® (NYSE: IMPR), the healthcare IT security company, covers the integration between PatientWorks’ self-service check-in solutions KioskWorks® and CheckinWorks® and Imprivata PatientSecure® to enable positive patient identification at self-service registration kiosks. Imprivata PatientSecure eliminates the need for providers and patients to input patient information manually by integrating with KioskWorks kiosks to make the single patient identifier available through kiosk registration. Kiosks identify patients through a palm vein scan, rather than requiring manual input of patient information, saving time and improving efficiency by eliminating the need for unnecessary paperwork. Imprivata PatientSecure is the biometric patient identification platform that uses palm vein recognition biometrics to accurately identify patients. Through an easy enrollment process, Imprivata PatientSecure creates a 1:1 link between patients’ unique palm vein scans and their individual medical records. Once enrolled, a patient simply scans their palm and Imprivata PatientSecure quickly and accurately identifies the patient and automatically retrieves their unique medical record. Imprivata® (NYSE: IMPR), the healthcare IT security company, provides healthcare organizations globally with a security and identity platform that delivers authentication management, fast access to patient information, secure communications, and positive patient identification. Imprivata enables care providers to securely and efficiently access, communicate, and transact patient health information to address critical compliance and security challenges while improving productivity and the patient experience. For more information, please visit www.imprivata.com. Columbus, Ohio October 12, 2015 – PatientWorks Corporation, a leading provider of self-service patient check-in solutions, today announced that it has entered into a marketing agreement with McKesson Corporation. As part of the agreement, the KioskWorks® and CheckinWorks® solutions from PatientWorks will be integrated with McKesson’s Paragon®, HealthQuest®, and STAR® software products and offered by PatientWorks to McKesson customers. The new relationship was announced at the McKesson Insight 2015 Conference in Nashville last month and was well received by McKesson customers who visited the PatientWorks exhibit. McKesson Corporation, currently ranked 11th on the FORTUNE 500, is a healthcare services and information technology company dedicated to making the business of healthcare run better. McKesson partners with payers, hospitals, physician offices, pharmacies, pharmaceutical companies and others across the spectrum of care to build healthier organizations that deliver better care to patients in every setting. McKesson helps its customers improve their financial, operational and clinical performance with solutions that include pharmaceutical and medical-surgical supply management, healthcare information technology, and business and clinical services. For more information, visit www.mckesson.com. PatientWorks Corporation provides Self-Service Patient Check-in Kiosk and Tablet solutions. KioskWorks® provides a patient centric, customizable user touch screen environment for self-check-in, co-payment processing, interactive wayfinding, event calendar, patient education and fundraising opportunities. The Patient Xpress module captures electronic signatures as well as patient photos and scans insurance cards and/or driver licenses. The data is merged onto the healthcare provider’s forms and automatically sent to their imaging system and/or routed to the Registrar. Queue Navigator manages patient volumes, wait times and check in compliance, whether patients check in through KioskWorks or directly with registration staff. Admitting personnel can manage patient check-in remotely in real-time at the department level or across the entire enterprise. For more information on PatientWorks, please visit www.patientworks.com or call Norman Snidow, VP Sales at (919) 238-4754. Email nsnidow@patientworks.com. PatientWorks today announced a strategic marketing agreement with Etelu Tech Co, a technology innovation company specializing in full service mobile web and application development with a focus in Healthcare and Education. The agreement provides PatientWorks with the ability to offer exciting new mobile apps for hospitals as an expansion of its leading patient facing solutions for the healthcare market. The new iOS and Android apps allow health systems to brand a mobile app to improve the patient experience with the hospital and its services. The app includes such features as WayFinding individuals within the healthcare facility, Find a Physician, Find an Office, Find a Lab, My Chart to view test results, Symptom Checker, Surgery Tracker to view the Surgery Tracking Board, Foundation Giving, Events Lists, and Push Notifications. Advanced Location Triangulation with Blue Dot technology from CISCO provides enhanced WayFinding features. Etelu is a technology innovation company specializing in full service mobile web and application development with a focus in Healthcare and Education. Etelu focuses on solving real world businesses problems with creative and cutting edge solutions. Etelu works closely with its clients to customize mobile apps for their unique environment. Etelu was a finalist for Best Mobile App in the 2014 Ragan’s Health Care PR and Marketing Awards. This is the second year in a row that Etelu’s healthcare app was recognized for innovation in media. Etelu is led by Rosemarie Francis, a 20 year industry veteran of integrated marketing, sales, business management and technical application leadership. eTELu is the registered trade name of Etelu Tech Co.
SalePoint today announced a strategic marketing agreement with Etelu Tech Co, a technology innovation company specializing in full service mobile web and application development. The agreement provides SalePoint with the ability to offer exciting new mobile apps for retailers as an expansion of its leading retail technology solutions. The new custom branded App is designed to improve the customer experience, increase customer loyalty and enhance the retailer’s brand. Features include location analytics, shopper background data, push notifications, geofencing and the ability for shoppers to receive turn-by turn directions to find a department or an item on a shelf. Find a Product – The app provides information about products and will navigate customers to the product location in the store. Find a Department – The app enables customers to locate a department and will navigate right to it. 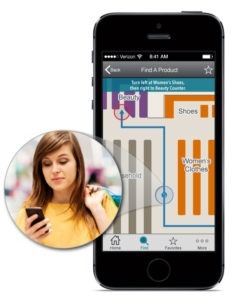 Find a Store – The app enables customers to locate rtailer’s store location and navigate straight to it. Parking – Customers may check out a map to identify all public parking areas and to get information about where to park to visit the store. Geofencing – Generate analytics and insights based on shopper location near and inside retail stores. Deliver relevant content to shoppers based on entering, moving about or leaving retail stores with geofencing triggers. Special Offers – Retailers can further utilize the geofencing feature to offer discounts for goods and services. Shop by Departments – Customers can browse for products by department. Etelu is a technology innovation company specializing in full service mobile web and application development. SalePoint’s subsidiary PatientWorks teams with Etelu on patient apps for the healthcare market. Etelu focuses on solving real world business problems with creative and cutting edge solutions. Etelu works closely with its clients to customize mobile apps for their unique environment. Etelu was a finalist for Best Mobile App in the 2014 Ragan’s Health Care PR and Marketing Awards. This is the second year in a row that Etelu’s healthcare app was recognized for innovation in media. Etelu is led by Rosemarie Francis, a 20 year industry veteran of integrated marketing, sales, business management and technical application leadership. SalePoint exhibited at the NRF Annual Convention in New York in January, 2014. SalePoint exhibited new functionality for our retail point of sale and corporate ERP solutions including integration with the Salesforce.com CRM application with our Trovato POS solution. In addition, the company introduced KioskWorks, self-service retail kiosks that include wayfinding, customer queue management, payment on account, in-store coupons, digital signage and other features to enhance the customer experience in retail stores. KioskWorks’ Wayfinding provides customers with step by step directions on how to find the merchandise or locations in the store that they are seeking without the assistance of a sales representative. You invest heavily in visual displays, signage, store layouts, and merchandise. Customers need to be able to find the merchandise they are looking for quickly and easily. 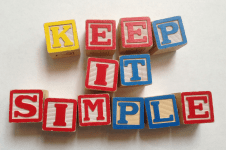 In large stores or stores with complex layouts, this is often not easy and may frustrate customers. Our Wayfinding solution presents a graphical layout of the store and presents a visual image of a person navigating to that area from the current kiosk location, allows the customer to search for the department or merchandise area they are looking for and importantly provides multi-language support to allow you to serve the diversity of your customer demographics. Print or email promotional coupons for customers based on their Wayfinding or other searches on the kiosk to promote merchandise in your store. The flexibility of KioskWorks allows you to establish workflows and rules on what coupons to present at what time. Drive additional business from customers who are visiting your store by offering them contemporaneous offers to buy more. Capture email addresses for promotional coupon distribution and other marketing efforts. Use dual displays on kiosks or wall mounted kiosks to provide videos and other messages to your customers as they shop in your store. Deliver your marketing messages clearly and effectively by developing content targeted to support your sales campaigns for seasons, holidays, or other promotions and to reinforce your theme with shoppers. A wide variety of hardware choices are supported to provide you with the most flexibility based on your store configuration. In areas where customers queue to wait for certain services, such as layaway, merchandise pickup, customer service, repairs, or returns, provide your customers with information and a clear process to queue up for the service. KioskWorks provides Queue Navigator to manage and track customers being processed through by your services teams. Your service staff has a visual queue showing the individuals waiting for service and the length of time they have been waiting. Customers can be provided with wait ticket numbers or see a visual of the current queue. Management can easily see the number of customers in the queue and how long the wait times are. If the wait times exceed a designated threshold, staff can be alerted to bring in additional resources to service the waiting customers. Reports provide real time and historical data on service levels. Better manage your service area and improve customer satisfaction with Queue Navigator. For more information on kiosks for retail, contact Norman Snidow, VP Sales at nsnidow@salepoint.com. Do You Need To Replace Your Current POS Platform To Perform In Today’s MOBILE Era? There’s no question that today’s retailers are embracing mobility to enhance existing workflows and to add new workflows. The question is: what is the best way to go mobile? Add on to existing systems or replace them entirely? SalePoint today announced that it had acquired the assets of the PatientWorks Division of the NewBold Corporation. SalePoint through a newly formed, wholly owned subsidiary PatientWorks Corporation acquired the assets of the PatientWorks business from NewBold Corporation. The terms of the transaction were not disclosed. PatientWorks Corporation will continue to operate from the Cary, North Carolina office with certain corporate administrative functions being performed by SalePoint in its San Diego headquarters. The effective date of the acquisition was February 22, 2012. Copyright @ 2018 SalePoint Inc.